Condensation refers to dampness or tiny droplets of water you see on your walls, windows and doors. It is one of the biggest problems that home owners have to grapple with. Warm air has more moisture retention capacity than cold air. Condensation forms when warm air containing moisture comes in contact with a cold surface causing it to lose its moisture. Air inside an average home contains about 50-70% moisture due to activities like cooking, cleaning, drying etc. If there is a structural defect in the house due to which moisture from outside creeps into the house or inadequate ventilation due to which moisture builds up inside the house, then the amount of moisture becomes too high for the air to withhold, leading to condensation. 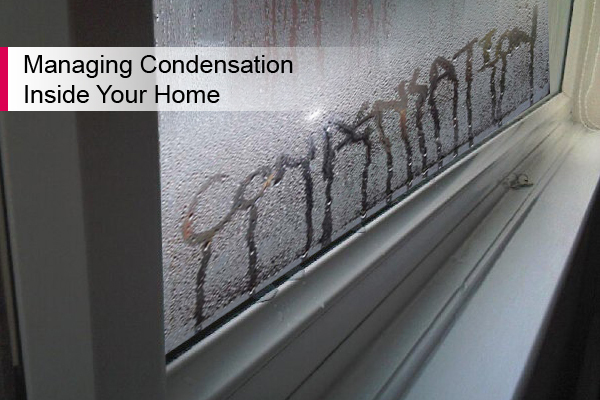 Why is condensation a threat to your house? Condensation leads to dampness which in turn leads to formation of mould. The dampness and mould can cause structural damage to your building and can even cause damage to your wooden furniture. It can spread into your wall insulation and affect wall plaster making your room unsightly. Plus it is a high health risk. Inhaling the spores can cause an allergic reaction and induce asthma attacks. Hidden condensation can be quite tricky to spot and may have caused damage before you even realize there is a problem. But condensation is best fixed at the earliest. Draught – proof your home to prevent entry of moist air from outside. Draught – proofing on its own can actually encourage condensation. Provide adequate ventilation or use extractor fans in moisture-high areas of the house like bathroom and kitchen to push moisture-high air outside. Keep kitchen and bathroom doors closed to prevent moist air from entering other rooms. Use tumble-dryers with a vent which can be connected to the outside. Use trickle vents in windows or a heat recovery ventilation unit to ensure good air circulation. Keep your house warm throughout the day to prevent formation of condensation. When drying clothes inside the home, close the doors of the room and open out the windows to let out moist air. Dehumidifiers can help in reducing moisture in the house. Keep them in rooms you are using and also in moisture-high areas. Double glaze your windows and insulate your walls to keep the inside of your house warm. Where you have cupboards and wardrobes against external walls, make sure you leave some gap between them and the wall. These small measures on your part can help in preventing or controlling condensation, keeping your house beautiful and strong for generations to come with Managing Condensation Inside Your Home. Cut In Solar Subsidy! How Does It Effect You? How To Become Debt Free This New Year?